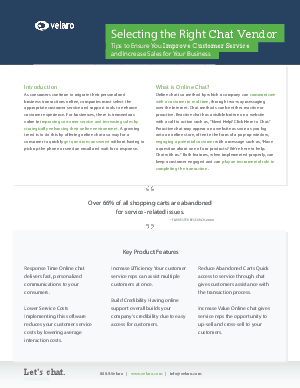 Research firms like Gartner, Forrester, and Aberdeen have all reported on the benefits of live chat software for e-commerce. Companies that effectively use live chat software see a dramatic increase in online sales conversions and customer service productivity. But reaping these benefits takes more than just purchasing a piece of software. This PDF provides some important tips in selecting the right chat vendor that can ensure that you get the most out of your investment in live chat.